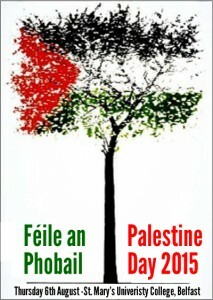 The Belfast branch of the Ireland-Palestine Solidarity Campaign is proud to once again host the annual Palestine Day as part of Belfast’s famous Feile an Phobail on Thursday 6th August. Events will be taking place all day in St. Mary’s University College on the Falls Road in West Belfast. Please JOIN and SHARE the event on Facebook here. Getting there from outside Belfast: Note that buses run frequently from Dublin, and operate around the clock and getting to St. Mary’s is very easy using the cheap service taxis. Buses also serve Belfast on other routes. The train from Dublin to Belfast also operates frequently, but the last return train is at 9.15pm. Stalls with books, football & T-shirts, scarves, badges and other solidarity items. Food available from 12.30. Award-winning documentary film The Lab by Yotam Feldman (60 mins. 2013). An expose of the Israeli weapons & security industry. The Israeli testing of weapons and ‘security methods’ on the Palestinians has been carried out on a far bigger scale than that carried out by the British military in the North of Ireland but the aim has been the same – the development of ‘the technology of repression’ for export and profits. Elaine Bradley – Irish human rights activist recently returned from eight months in Gaza and the West Bank. Phil McCullough – Lights for Gaza. Chair: Clara Reilly – Relatives for Justice and founder member of the United Campaign against Plastic Bullets). 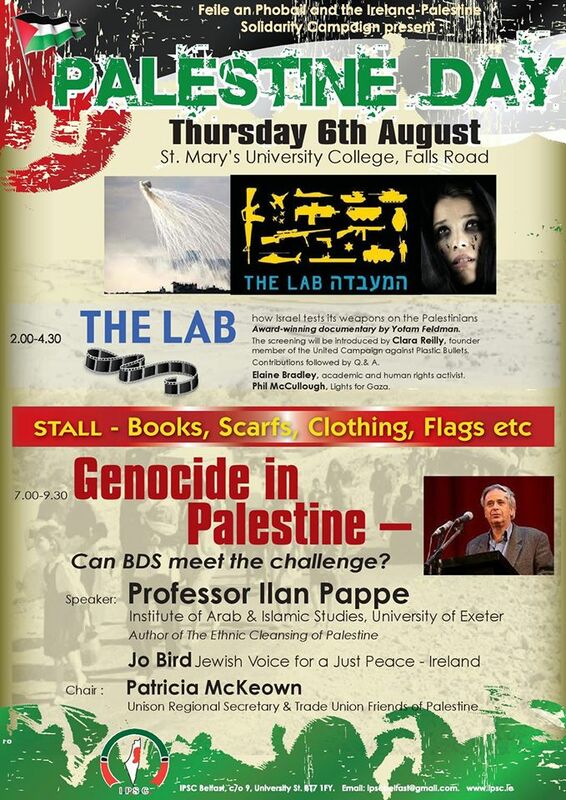 7.00pm – 9.30pm – Genocide in Gaza: Can BDS Meet the Challenge? With Ilan Pappe, Jo Bird and Patricia McKeown. Ilan Pappe – World-renowned historian at the Institute of Arab & Islamic Studies, University of Exeter and author of The Ethnic Cleansing of Palestine, The Idea of Israel, The Forgotten Palestinians, The Modern Middle East and Out of the Frame. Organised by Belfast IPSC as part of Feile an Phobail.